The funnel cap along with the tripod mast mounted to the funnel searchlight platform tells that this is the Gneisenau. Another clue could be the port shifting crane although I can't say for certain whether Scharnhorst had this. Her early sketches as well as the model of the ship displayed at the Naval High Command offices show this crane although I've never actually seen it being used. I assume this image could have been taken during her Atlantic Cruise, 12th June - 26th July, 1939. The short shadows on deck verify that the sun stands quite high on the sky and I would guess she's sailing in the waters around Cape Verde, Madeira or the Azores at this point. 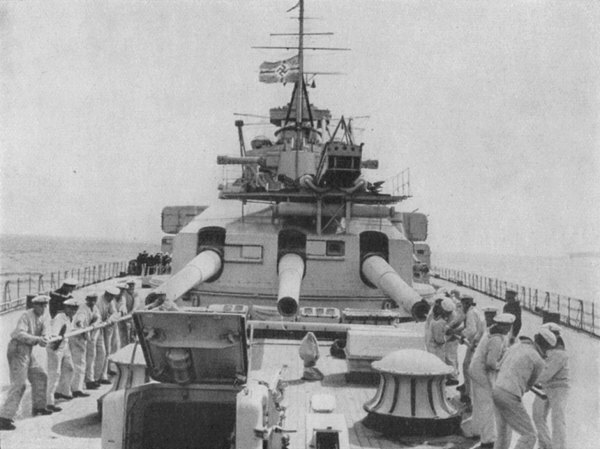 Although the Scharnrhost initially also had the tripod mast attached to the funnel, in this case the funnel cap is a key feature that differentiates her from the Gneisenau. The photo was most likely taken during the summer of 1939. On the far right horizon I notice a faint blur - is this cloud or is it actually land? Did Gneisenau actually make any landfall on this cruise? The Gneisenau departed Kiel 12 June 1939 and ventured around Jutland (I've often wondered why she did not use the canal and concluded that they must have been doing something here in that period, such as channel floor maintenance or repair on the locks at either Brunsbüttel or Holtenau) and then made a stop at Wilhelmshaven. Around the Danish peninsula, she was accompanied by the Deutschland, returning to Wilhelmshaven after trials in the Baltic. I presume Gneisenau might have topped out her fuel tanks here. She went through the English Channel and southwards past France and Spain and then made a brief sweep into the Mediterran, past Gibraltar, and thereafter set course towards the Canary Islands where she moored at the outer pier of the harbour in Las Palmas. After LP, she went south and I've boldly assumed that she carried out various exercises in the waters north of Cape Verde before heading towards Madeira and the port of Funchal. Unlike LP, she laid at anchor in Funchal and also had German officials on visit aboard. If I was to estimate the place of the picture above, I'd say it could have been taken while she was approaching Madeira, sometime after gunnery trials, and that you might actually see the contours of that coastline in the picture above. After Funchal she went further north and conducted anchor drills in between the islands of the Azores. I've yet not seen any photos that could suggest her making port here. After Azores, she set sail for home again and arrived in Kiel 26 July. Btw, have you noticed the ship's band rehearsing at the port side of the hangar deck..? Thanks for that piece of information Terje. I had no idea the Gneisenau visited Las Palmas. One day I would like to compile a list with all the Kriegsmarine ships that visited Spanish ports. Yes, I know that website, but I guess I never took enough time to see those photos.